Have you ever tried your hand at being an entrepreneur? 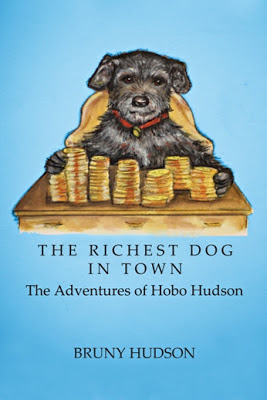 I hope that everything worked out great if so, but if not maybe you can give it another try after reading The Richest Dog in Town: The Adventures of Hobo Hudson. The book is written by Hobo Hudson, a small terrier living in Florida with his mom and dad. He shares several short stories of how he came from rags to riches. It wasn't easy, but with hard work and dedication Hobo was able to become a successful business-dog. I was absolutely delighted to have the opportunity to read and review The Richest Dog in Town! Hobo's life starts out rough, but he finally manages to find his perfect family and trains them to match his needs. He's also able to work out some compromises with his cat sisters, who also meow their own opinions in the book. After getting settled into his forever home, Hobo becomes an entrepreneur and successfully runs several growing businesses. He's always looking for a good way to make a buck. He's a millionaire in no time! Running a business can be hard work and he does run into a few unfortunate events along the way. A successful clothing store on Ebay. A cruise ship for people and dogs. Smuggling Cuban cigars into America to sell on the black market. Hobo has many more great business ideas, which you can read about in the book. Who knows - you may just be inspired to start your very own business! However, Hobo isn't all work and no play - oh no. He travels the world to visit his friends and shows them all how to have a good time. The Richest Dog in Town by author Bruny Hudson is a wonderful collection of stories from Hobo's point of view. If you're looking for a good dog book with a fun twist, this is the one for you! I found that I was smirking and chuckling to myself quite often while reading it. If you'd like to purchase The Richest Dog in Town: The Adventures of Hobo Hudson, it's available at Amazon and Barnes & Noble as a paperback. You can also download a copy to your Kindle. You can visit Hobo at his mom's website - News and Tales - and his blog if you're interested in reading more of his fun adventures. Bruny and Hobo were also nice enough to offer Pawsitively Pets' readers a chance to win a copy of their fabulous book! This giveaway is open to the residents of the United States & Canada only please. All you need to do is fill out the Rafflecopter form below. Choose as many entry options as you like - they are not all mandatory but the more you complete, the better your chances at winning. Giveaway will end next Thursday, June 13th at midnight CST. Good luck! Disclosure: I was not compensated for this book review. Bruny Hudson sent me a copy of The Richest Dog in Town to review, which I was very happy to do. All thoughts and opinions expressed here are my own! Winner of the book giveaway will be contacted via email once selected. The winner has 48 hours to reply to this email or a new winner will be selected. Pawsitively Pets is not responsible for shipment of prize. Only US and Canadian residents may enter. sound a fun loving pup! Sounds a great read. We can't join in as we are across the pond. Have a terrific Thursday. Sounds like a great book. I enjoyed your review. That sure sounds good and such a cool woofie! He is pretty cool Brian - plus he has some very cool cat sisters. He also makes friends with a lot of other cats in the book too. Wow! Sounds awesome! I'm not a big reader but I'll definitely pass this along to others who are! It looks like an interesting book, although I'm sure not enough room is left for the cat sisters' ideas. Sorry not to have visited lately - I just noticed that I had to subscribe again. My human is NOT doing a good job! How cool! A book written by a dog who lives in the same State as me!!! I may have to try my paw at winning it! Great review, Miss Ann. I'm sure you and Hobo would make great friends Oz... he is a terrier like you too! Hobo sounds like one hard working pup! What a cute book! Heh heh, if I was a successful entrepreneur do you think I'd be doing this blogging thing? I'd be relaxing by the pool with a niptini in one paw and a smousy in the other. I've told TW I need a swag shop but she's too lazy. Sigh! That sounds a fun book! I like all books with dogs.